This morning Nancy came bearing a gift–a red folder with an update on Leo. 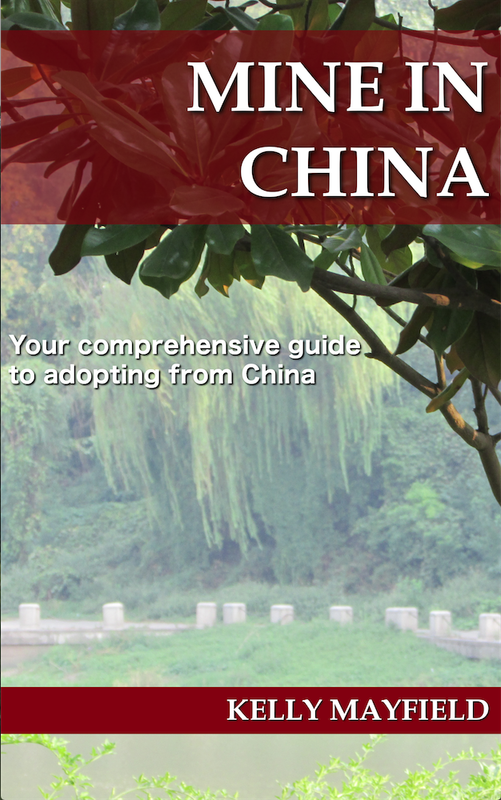 It had some new pictures, Chinese phrases, advice on getting around in China and things along those lines. 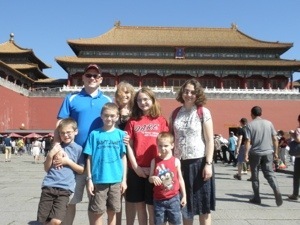 We went out this morning to Tiananmen Square and the Forbidden City. 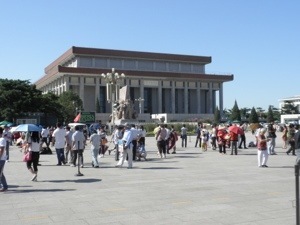 As we approached Tiananmen Square, we got to urban Beijing that I was expecting when we got here. There were people everywhere and 12 lanes of traffic. I was very glad to see an underpass so we didn’t have to cross the street. As large as the Square was, the crowd was never shoulder to shoulder crowded, just state fair on a Saturday crowded. 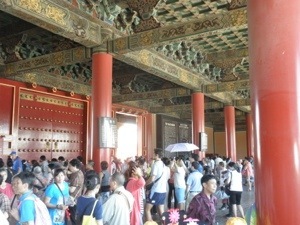 There were lots of tour groups and sellers with Chinese army hats and things like that. Chinese ladies here certainly take their sun protection seriously. I’ve only seen face masks on commuters. Most women were wearing large sun hats or carrying umbrellas. I saw quite a few Muslim Chinese women wearing hijab. Our guide Nancy was wearing a full array including a light jacket, gloves for her hands, a sun hat, and an umbrella. When her umbrella broke, she purchased a new one from a street vendor. Again, we attracted a lot of attention. One man counted the number of children in english and then gave Matt a thumb’s up. For the first time someone wanted a picture of Mary Evelyn with her daughters and as I thought, Mary Evelyn was less enthusiastic than the boys to have her picture made with strangers. 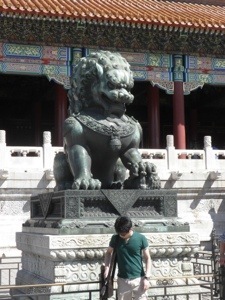 The children got tired of the Forbidden City pretty quickly. I think we were expecting to walk from room to room, but instead it was open area to open area. It was another clear day, but hot and sunny since most of the areas didn’t have any shade. Like our visit to the Great Wall, it was very impressive to walk on something that is older than our country. 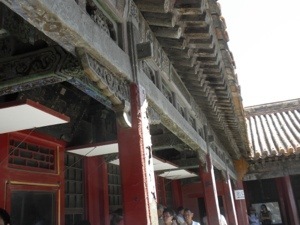 Some parts in the outer area had been well preserved but I was surprised at the poor condition of the inner areas where the Emperor and his concubines lived. There were windows where you could look in and see the furniture and everything was covered in dust. The wood in the ceiling above was rotting away. I hope they eventually restore those areas. When we finished at the Forbidden City we stopped for lunch where we met Sue, a staff person from Holt. We shared several dishes of food. We were so hot from the Forbidden City that we paid to buy an extra liter of Coke to share because there are no free refills. Nancy keeps marveling at how independent Vincent is. She tells us that since most people have only one child, they are usually spoiled and it is normal to see parents hand feeding children until they are 6 or older. 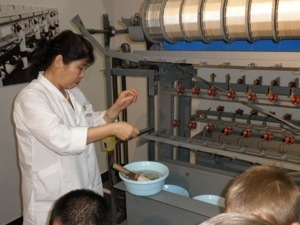 We were pretty wiped out after the food, but we still had to go to the silk factory for another sales pitch. It was very fascinating to hear about the two types of cocoons, to see how the threads were spun, and we all got to help stretch silk batting out for a quilt. Once we were done there we finally got to come back to the hotel for a rest. We are planning to go out again for our last night in Beijing. Tomorrow morning we will pack up and fly to Nanjing in the early afternoon. I’ve had a lot of trouble staying connected to the internet while I was writing this post, so I apologize if the formatting is strange or if the pictures don’t quite match up with the text. Yeah, I was disappointed in the “tour” of the Forbidden City. Just going from courtyard to courtyard does get a little monotonous. However, when I could hear and understand our guide, the information about it was interesting. And when we stepped on some of the original cobblestones I had to take a picture.